What is unique about the Vi-Shape Nutritional Shake Mix? There are so many unique qualities! Vi-Shape is the “the shake mix that tastes like a cake mix™”. Other shakes can be gritty or leave a bitter after taste. 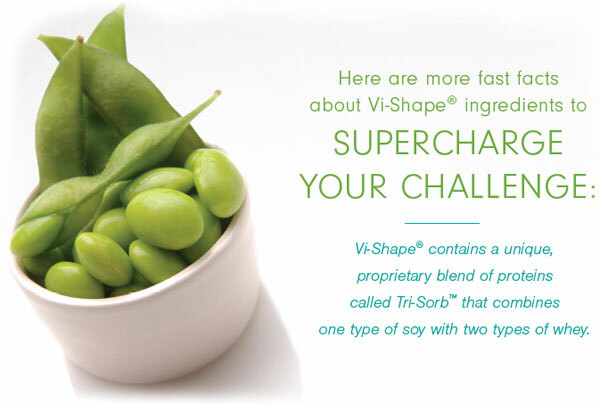 Vi-Shape mixes easy, supports digestive health, bone health, muscles and provides amazing nutrition. It is low fat, low sodium, and lower carbohydrate and sugar than other brands, and it uses our unique Tri-Sorb™ protein blend. What are the Primary Benefits of the Vi-Shape Shake Mix? Gluten-free, lactose-free, low sodium, and friendly for those watching their sugar intake! Okay, but how does it taste? Remember when you were a child, and your mom would let you lick the cake batter off the wooden spoon or out of the bowl? This is why we call it “the shake mix that tastes like a cake mix™”. This Sweet Cream flavor also makes an excellent base for adding different flavors like fruits and our patent-pending Shape-Up™ Health Flavor Mix-Ins. This variety helps make your diet more interesting, so you don’t get bored with just one flavor. Other shakes may be gritty, or leave a metallic or bitter taste. Not Vi-Shape! The secret? Quality ingredients. What is the best way to lose or maintain weight with Vi-Shape shakes? To lose weight, we recommend replacing 2 meals per day with Vi-Shape shakes and eating a healthy third meal, along with an exercise plan. If you need to snack, enjoy sensible snacks (like veggie sticks, fruit, the ViSalus Nutra-Cookie™, a single serving of cottage cheese, string cheese or almonds). To maintain weight, we recommend 1 shake per day, ideally for breakfast, along with a healthy diet and exercise. The shakes will provide your body with healthy protein and fiber, fewer carbs, all for fewer calories than typical breakfasts. You may also want to integrate Vi-Slim® Metab-awake! into your regimen to support metabolism, and add Vi-Trim® Clear Control Drink Mix to the shake to help keep hunger at bay. How does Vi-Shape fit into my workout and everyday activity? 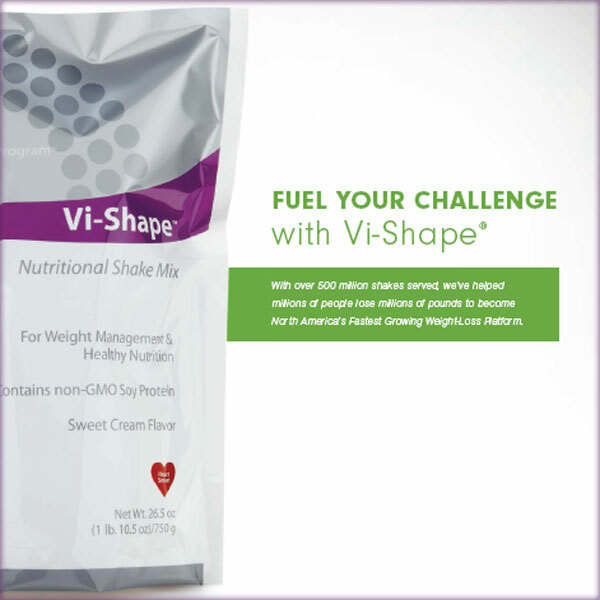 ViSalus Vi-Shape provides a balanced meal for people on-the-go. It can also be used post workout to fuel your body with protein to support lean muscles. Simply carry a packet to the gym, mix in water and enjoy. A Vi-Shape Nutritional Shake is like a fast meal, providing you the needed protein (20–22 grams when mixed with non-fat milk or soy milk) to help control hunger and build lean muscle. How does Vi-Shape measure up against other nutritional shakes? Tell me more about these proteins. They’re unique to Vi-Shape and are specially processed to remove lactose, fat, carbohydrates and also the isoflavones from the soy. We use two types of super-concentrated whey proteins, along with soy. Why are there artificial sweeteners in Vi-Shape? The shake was designed to be friendly for those watching their sugar intake. We use a small amount of Sucralose to be friendly for those watching their sugar intake (about 1/4 of a diet soda). Sucralose has been approved by the World Health Organization, The Diabetes Association, and by over 85 countries’ regulatory and health agencies. No other sweetener has as much broad approval or safety studies. Other sweeteners can spike hunger, may cause gas or have other health and diet issues. Since the average person consumes 2–3 pounds of sugar per week (over 100 pounds more per year than just 25 years ago) and sugar adds to obesity and diabetes, we chose to make our shake with less than 1 gram of sugar. Can I mix Vi-Shape with water instead of milk? The shake can be mixed in water for a healthy snack, or after a workout to support healthy muscles and recovery. The goal is to get enough protein and calories (1,200 per day are recommended by the U.S. government for women to lose 1–2 pounds per week, and 1500-1800 for men) or the body can go into starvation mode and can slow down metabolism. For a meal, the shake should be mixed in milk, as extra protein and calcium are beneficial. So if you do use the shake mixed in water as a meal, you may want to use 3 scoops instead of 2, or enjoy a Nutra-Cookie to compensate for the calories and protein you don’t get from milk. You can, however have a shake after a workout to help your muscles recover, or as a snack. Can kids use the shake? Yes. Children ages 4–12 can have 1 scoop of shake mix. Children under age 4 have a different ability to process protein, so it is not recommended for them. The shake mix is not intended for children to use for weight-loss. How can the shake be lactose free if it has whey protein? The lactose is separated out as the whey is extracted from milk. You can find “lactose free” milk at the grocery store. Can I use if I am pregnant or nursing? Our shakes are a great way for pregnant or lactating women to get added protein, calcium, fiber and nutrients in their diet. We do not however, recommend that pregnant or lactating women use them to try to lose weight as the baby needs the calories. This is why we have a warning on the website, as pregnant or lactating women should not try to lose weight. Yes. The shake is gluten-free. Our plant also makes our Orange Health Flavor Mix-In that has a little gluten in it. The plant is kosher and utilizes good manufacturing practices. The risk of cross contamination is minute. Is the shake OK for those watching their sugar intake? Yes. The shake powder mix has 7 carbs, and 5.5 of them are from fiber, a great carb. If you need more carbs per meal, it is easy to add to the shake. The shake is also low glycemic, about 1/3 of an apple on the glycemic index. Yes, soy protein has been consumed for thousands of years. Soy protein is protein “isolated” from the soybean. Soy protein isolate has been used since 1936 and used widely since 1959 in foods and for its functional properties. There are many health-promoting amino acids in soy protein and it is simply made by mashing up soybeans, and using a cross membrane filter (similar to making purified drinking water) to extract the protein, and separate out isoflavones. Of the concerns over soy, there are a few common ones. First, some concerns relate to raw soybeans, which can contain a form of phytic acid that can block the absorption of certain minerals. However, that is based on large consumption quantities, of the raw soybean and only occurs in those animals that lack the digestive enzyme phytase. It is only an issue for people who consume those foods to get minerals in their diet, and in large quantities. The issue is primarily in developing countries, and may have a genetic basis as well because they are lacking the digestive enzyme (which can be supplemented and therefore alleviate the concern). It is not an issue for our products because of how we process the ingredients. The second common concern with soy refers to some of the components of soy, particularly the isoflavones genistein and daidzen which can affect thyroid health, which is necessary for the production of T3 and T4. Our soy has been processed to remove the isoflavones. A third common concern about soy is its effect on estrogen levels in the body. This is again due to the isoflavones, which have been removed. There are isoflavones (like antioxidants) in most foods. Many menopausal women supplement with isoflavones. Lastly, our soy is not genetically modified (it is non-GMO). Many people worry about genetically modified soy, and whether any of the ingredients were altered in the breeding process. We use the most natural form we can get, that has not been genetically modified. We use soy because it is a complete protein that is easily digested, and adequate consumption of soy in the diet can help maintain healthy cholesterol levels that are already within the normal range and help support lean muscle mass. PS – Like, Share and COMMENT below. Let’s talk about Vi-Shape. Where can I best help YOU with additional Vi-Shape Questions? Or if you’re ready to start losing weight today… click here to place your order for Vi-Shape.